The Kickstarter campaign initiated by Pimax raised the US$200,000 funding goal in less then 2 hours, so the company is now expected to ship the first models in February 2018. The 8K headset comes with dual 4K displays and can be pre-ordered for US$449, while the 5K version integrates dual 2560x1440 displays and costs US$349. The maximum resolution for the upcoming VR headsets announced by Oculus, HTC and Microsoft ranges between dual 1080p and 1440 x 1440. 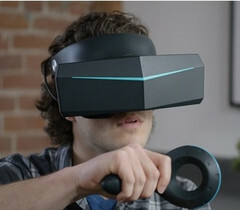 However, Pimax thinks VR headsets should benefit from larger resolution displays for a better immersive experience, and its latest 8K VR headsets stands as solid proof. Pimax first presented the 8K VR headset at IFA this year as a prototype, but the company did not mention anything about a commercial release. The latest Kickstarter campaign initiated by Pimax informs about a possible 2018 release. The fact that the initial US$200,000 funding goal was exceeded in less than 2 hours after the campaign launch should now ensure the 2018 release. Pimax is also offering a 5K VR headset version, but this one does not seem to be of too much interest, as almost all the Kickstarter backers are pre-ordering the 8K model. Unfortunately, at these high resolutions, Pimax could’t make standalone headsets, and the additional processing power requirements are quite steep: 16GB of RAM, at least a gen 7 Core i7 CPU, and an NVIDIA GeForce GTX 1080 GPU or better. The 5K headset (dual 2560x1440 displays) appears to be running fine on a GTX 1070 GPU or an R9 Nano GPU from AMD. The 5K headset can be pre-ordered for US$349, while the 8K version is priced at US$449. For the base station and motion tracker package you’ll have to pledge US$699 and US$799, respectively. With the funding goal already exceeded, Pimax is expected to make the first shipment in February 2018.